My Etsy favorites are filled with fabulous handmade items for baby. These are among the very best: 1. Applewood Baby Teething Toy by KangerooCare. // 2. Knitted Triangle Pattern Baby Blanket by YarningMade. // 3. You Are My Sunshine | Gold Baby Onesie by trulysanctuary. // 4. The Pug Plush Wool Pill by threebadseeds. 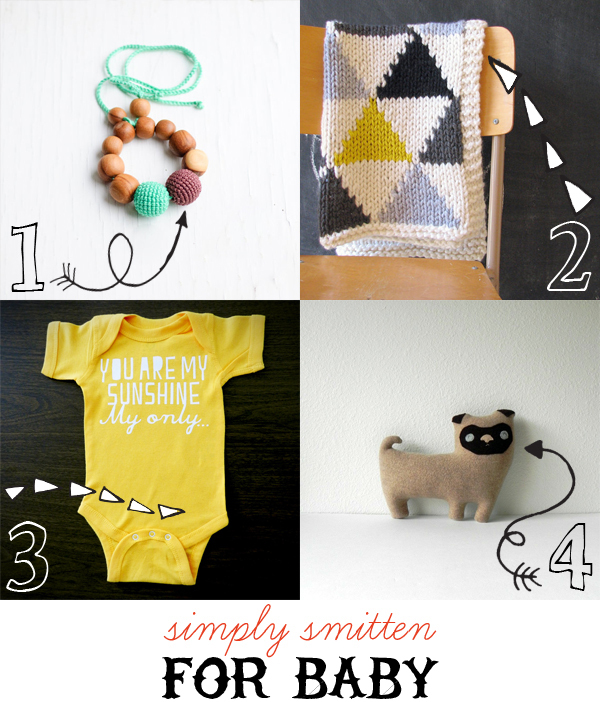 What a gorgeous baby and awesome blog!! Thanks so much for including my blanket in your post, love all your picks. Thank you! !